New Year’s Eve is slowly inching its way up my list of favorite holidays. Birthdays, Christmas, Valentine’s Day, yes… but New Year’s Eve? There’s never any shortage of party. 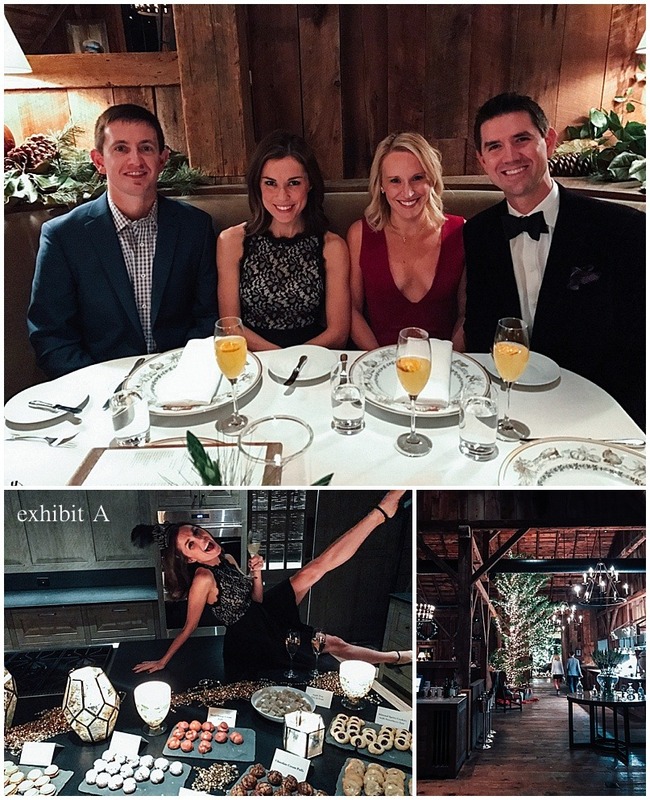 For the second year in a row, we earned our New Year’s Day hangovers in the hills of the Smoky Mountains at Blackberry Farm in Walland, TN. A luxury hotel boasting strong culinary offerings and a James Beard Award winning wine and dining program, Blackberry Farm is a cozy, Southern retreat for those in need of a good meal and R&R. 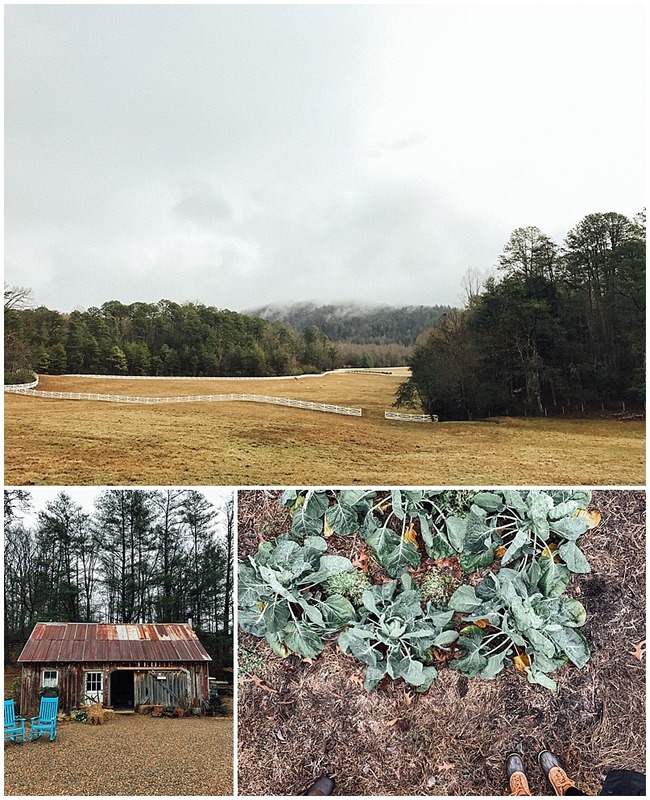 We visited Blackberry Farm this time last year (you may remember this post about it), and enjoyed it so much that we made reservations to visit again only a week or two after returning home. The resort, just as I recalled, was nothing short of magnificent, and we had a terrific time ringing in the New Year. Much like last year, Brett and I made the trip north with our friends Rayne and James. Leading up to the trip, Rayne and I spent an obnoxious amount of time preparing our packing lists, which included shopping for glamorous outfits to wear to the New Year’s Eve party. After searching everywhere for the perfect cocktail dress, I ended up raiding my sister’s closet, borrowing her black lace dress from last year’s homecoming. All of the trip preparation ended up being totally worth it because the New Year’s Eve party did not disappoint. I spent the evening fangirling some country music stars that were at the party (*cough* Little Big Town and Rascal Flatts *cough*), tripping over the dance floor with Brett, and eating my feelings at the dessert bar (see below for exhibit A). The party was rad, but honestly, who wouldn’t feel like a million bucks dancing the night away with their man-friend and sipping champagne cocktails with their BFF. Also, let’s not forget that I had managed to shimmy myself into my teenage sister’s LBD- a little fact that made me fist pump every time I thought about it. The weekend was incredibly relaxing, complete with some walks around the property, morning yoga, a trip to the spa, and a few hours each day spent cuddled around the fire. The only downside was the two (or seven) pounds I gained while there from day drinking consuming so much food. WORTH IT. Blackberry Farm boasts some of the best food and dining I’ve ever experienced in my life, so I spared no calorie, sip, or bite in making sure that I got the best of what the resort had to offer. I meant to bring my camera to share some images of the trip, but I saved my luggage space for all the pairs of Spanx I needed, so you’ll have to settle for these iPhone shots instead. 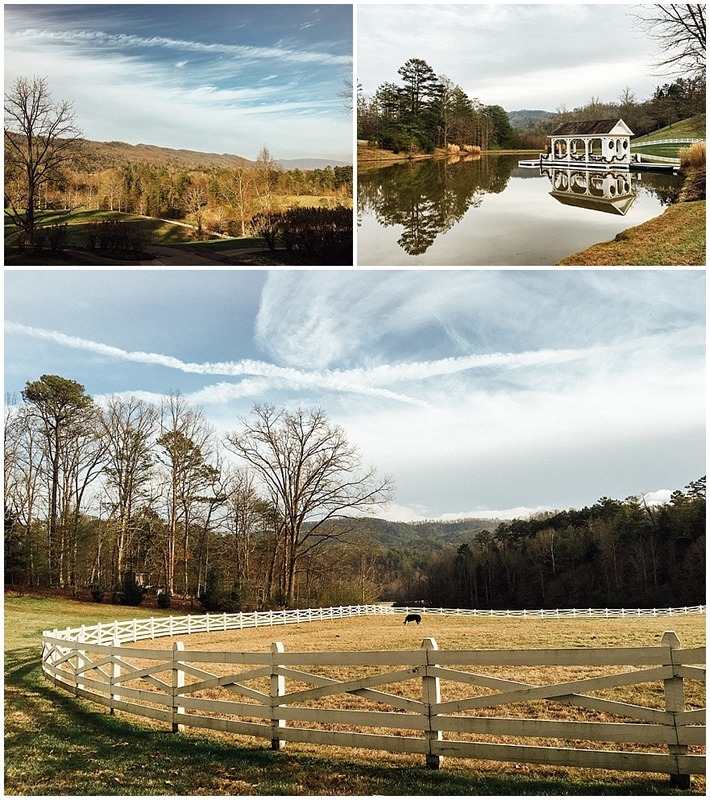 Even so, there’s no denying the beauty of Blackberry Farm and the fun that we tucked under our belts there. If you ever get the opportunity to visit, I urge you to do so- it’s fab. 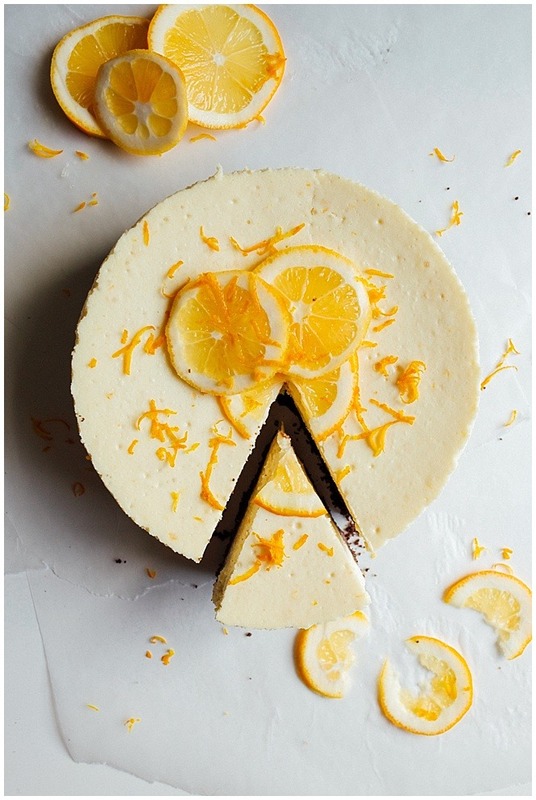 So are you ready to hear about this Meyer lemon cheesecake yet? Meyer lemons are the sweeter, more floral tasting sister fruit to the regular old lemons you might commonly buy. They usually pop up in the grocery stores throughout the winter, so if you see them, GET THEM. They are a prize to be honored in your kitchens, and add wonderful flavor to sweet and savory dishes alike. Meyer lemon cheesecake, with its fancy citrus, black bottom, and rich, decadent taste, feels like a fancy dessert fit for celebrating the new year. Maybe throw on your little sister’s dress, eat some cheesecake, and feel like a rockstar for a minute. Maybe make this Meyer lemon cheesecake and dream about all the good stuff this coming year has for you. My prayer is you’ll find lots of joy, love, and cake in 2017. Happy New Year! 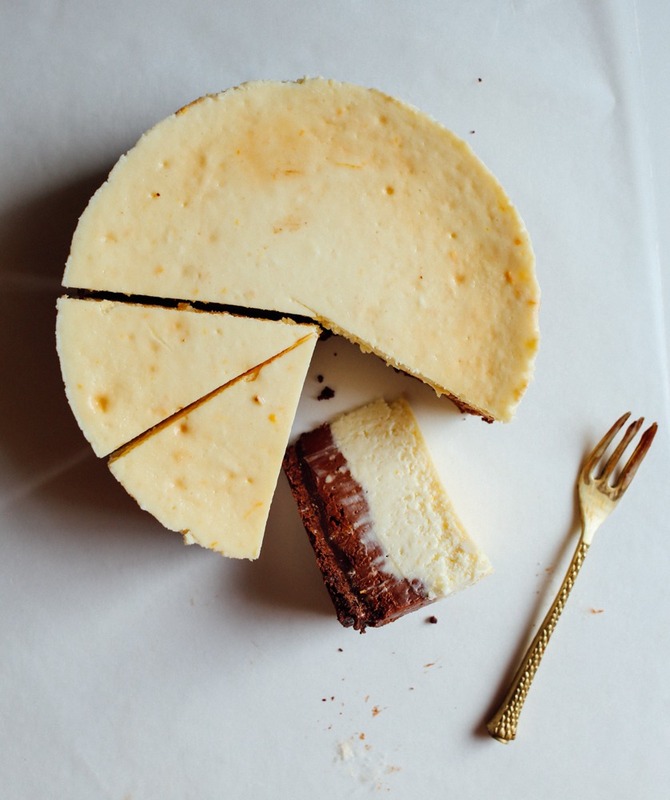 This meyer lemon cheesecake is a black bottom cheesecake with a chocolate crust. 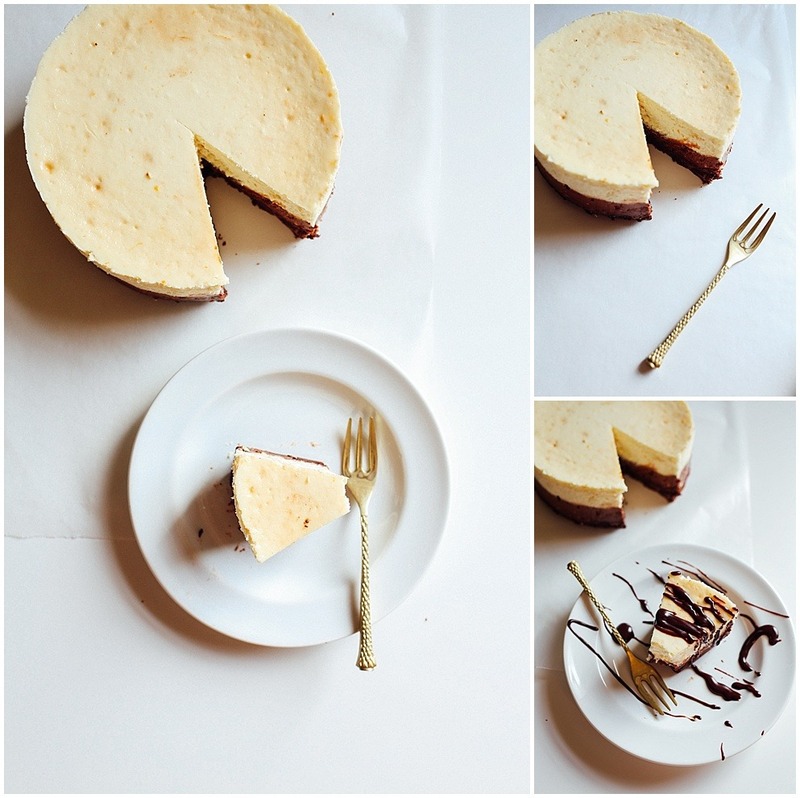 Tart and creamy, this cheesecake is a great make ahead dessert option, and is a rich and lemony treat, perfect for the chocolate and fruit lovers in your life! Prepare a 9″ springform pan by wrapping it in sheets of aluminum foil. I use 3 layers of extra wide foil wrapped to the top lip of the pan. Spray the inside walls and bottom of the pan with cooking spray. Stir together the dry ingredients until combined. Add the melted butter and stir just until combined. Gently pat out your chocolate mixture evenly into the bottom of the pan. Set aside while you prepare the cheesecake filling. Preheat oven to 350 degrees and get some water boiling in a kettle or saucepan for your water bath. Set a glass bowl over a pot of simmering water and melt chocolate. Set aside to cool slightly. Add the sugar and beat on medium for an additional 1 minute. Add eggs, one at a time, and beat to combine an additional 1 minute. Scrape the sides of the bowl and then add the heavy cream, vanilla, and lemon juice. Beat to combine. Strain the cheesecake batter through a mesh strainer into a reserved bowl and then fold in the lemon zest. Remove 3/4 cup of the cheesecake batter and stir it into the melted chocolate. Spread the chocolate cheesecake over the top of the chocolate crust. Next, pour the remaining cheesecake batter over top of the chocolate layer. Gently rap the pan on the counter to help any air bubbles escape. 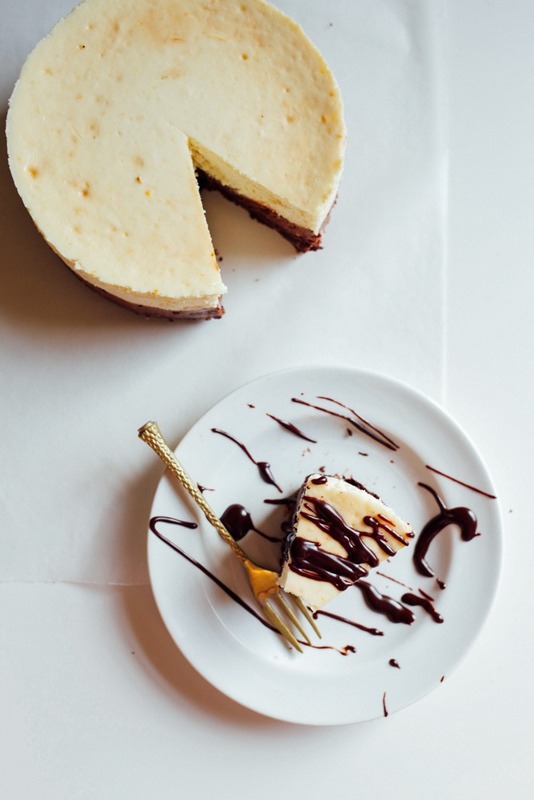 Discard the water bath, remove the foil and then place the cheesecake in the fridge to chill for several hours or overnight. The cheesecake can be stored in the fridge for several days. 3/4 (65 gm) cocoa powder, sifted I assume this is cups?? whoops! yes! thank you for catching that! Kate, how long do you bake the crust for? I want to make this for my office this week as a special surprise! Thanks for your help in advance! wow. i’ve heard so much about blackberry farm (not to be confused with the one i’m more familiar with in the bay area, which is more of a family pool and picnicking type of place), but i never realized how gorgeous it is! and that dessert bar needs no further comment. Ha! It’s so funny you mention that. I was yelping BF and ran across that pool area…. NOT the same as the one I went to. I highly highly HIGHLY recommend a visit. It’s fantastic.